WICKER PARK — The city's new Divvy bike-sharing program might be all about sharing, but when it comes to taking over free local parking spaces, local business owners said it's not being very generous. 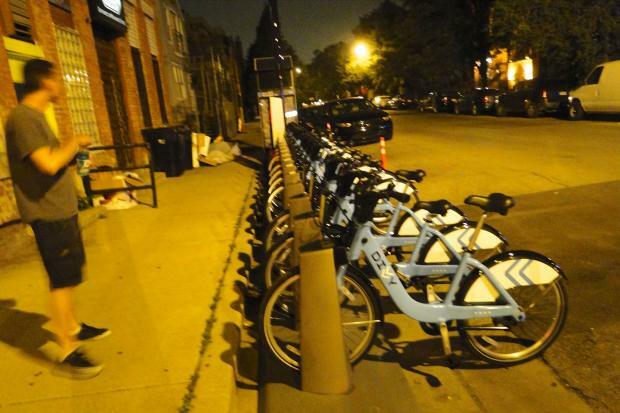 Among the 70 stations installed throughout the city in June, eight are in the Wicker Park, Bucktown and West Town areas, and two of those have been moved from their original spaces, Chicago Department of Transportation Deputy Commissioner Scott Kubly confirmed Monday. One relocation has upset Bob Stepien, co-owner of Beachwood Inn, a popular dive bar at 1415 N. Wood St. in Wicker Park. Stepien said he "doesn't know why" they moved the station, which was originally installed at 1389 N. Milwaukee Ave. in 2½ metered parking spaces next to Walgreens. The new spot for the Milwaukee/Wood Divvy station is in front of his bar, where he said there was once "free, un-metered and un-permitted spaces." Stepien said the bike station takes up six free diagonal parking spots that were used by residents, employees of local businesses and patrons of his bar. "It's stupid ... they took away free parking. I'm upset, I used to park there, too," Stepien said. Alex LoBianco, a front desk receptionist at Floyd's Barbershop, 1409 N. Milwaukee Ave., said she witnessed the station being installed Wednesday when she walked into work. "It takes away from our clients and workers. It's one of the last places in the neighborhood that's free to park and no permits," LoBianco said. LoBianco wondered why they didn't put the 50-foot station containing 15 bikes in front of 7-Eleven, where there is diagonal metered parking. Stepien questioned why the city did not move the rack on the sidewalk in front of the northern entrance to Walgreens rather than in the unmetered free spots. Kubly said the station was moved from Milwaukee Avenue and onto Wood Street for safety purposes, since it was initially installed into a "sharrow," or shared car and bike lane. "In the process of siting 400 stations, we realized [1389 N. Milwaukee Ave] didn't have a traditional bike lane, it's a sharrow, and people would would have to pull their [Divvy] bike out into the street," Kubly said. Sharrows are used in roads that are too narrow for a traditional bike lane, such as the 0.7-mile stretch of Milwaukee Avenue between North Avenue and Division Street. That stretch, according to a newly released city report on bike crashes, is ranked as having the highest number of nonintersection-related crashes, with 70.1 crashes per mile between 2005 and 2010. "We think it's better it's off the main street," Kubly said of the station. Kubly said that only five diagonal spots were removed on Wood Street for the station, not six. In addition to the relocated Milwaukee Avenue station, Kubly said a station at Augusta and Wood in West Town was moved west "about 20 or 30 feet" so that it did not interfere with a turn lane at the intersection.